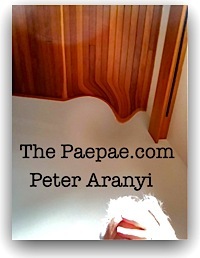 « Did Tame Iti *really* ‘pose a risk to the community’? This loutish, heavy-handed propagandist makes a habit of cyberstalking, goading and abusing public figures and those whom he perceives as the National Party’s political enemies … and some within the Party who have offended him like Michelle Boag who knocked his dad off the Party President perch. I see Cameron Slater as the horse meat “beef lasagne” of South-East Auckland social media, with his frequent use of deceptive labels. He exhibits an at best tenuous grip on the notion of ‘facts’ — routinely twisting and distorting real events with apparent disregard for fairness and accuracy. He gives spin doctors a bad name. Cameron’s schtick is fizzing up nonsense for the purposes of Shock! Horror! spittle-flecked and dishonest attacks on people with whom he disagrees online. His purpose is to ‘hurt’ them. If by his ravings and incitement of his followers he can cause negative ‘real world’ effects for his targets (like, say, financial, or their employment), then all the better, according to this nasty bully-boy. (He has spelt all this out on his histrionic hate blog — search for ‘NFWAB’.) So much for free speech. Cameron also gloatingly celebrates a ‘Sledge of the day’ (so long as it’s not one aimed at him or one of his his political heroes, right?) 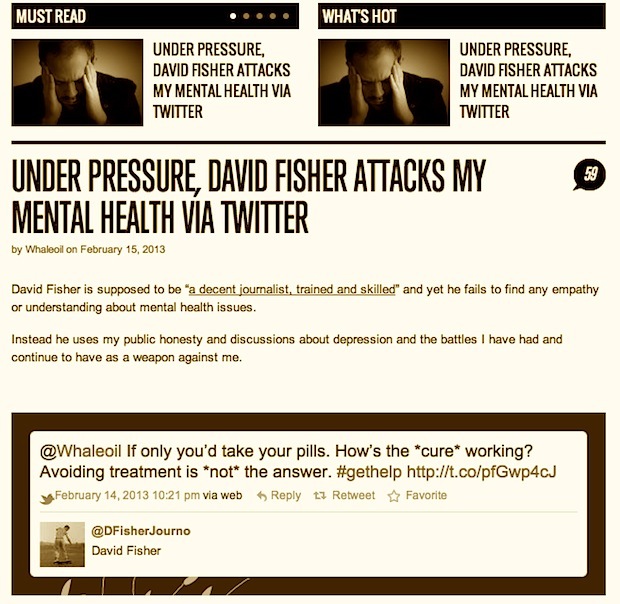 But, oh noes, today Cameron is breathlessly affecting a case of the vapours with journalist David Fisher for a mean joke on Twitter (oh, please) which cited one of Cameron’s blog posts about depression … as merrily documented on his blog in his typical shrieking, one-eyed, half-the-story fashion. Cameron Slater promoting hatred and deceitfully playing the victim. What is David Fisher’s comment a REPLY to? See below. 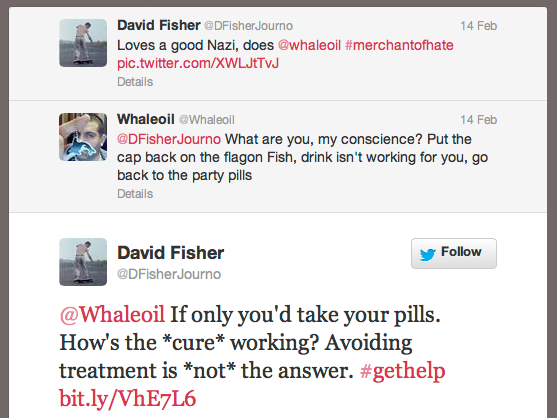 Predictably, Mr “FFS I am not a journalist” selectively omits relevant facts in an effort to smear David Fisher. Fisher’s tweet (ugh) was a response to Cameron’s own nasty little ‘sledge’: a bitter little tweet (shoot me) suggesting ‘drink isn’t working’ and Fisher should ‘put the cap back on the flagon’ and ‘go back to the party pills’ … neatly himself raising the subject of pills — taking them or not taking them. And, go back another step, that was Cameron’s response to smart-alec Fisher highlighting on Twitter (argh!) Cameron’s blog comment in support of Greece’s neo-Nazi Party being represented in the Greek Parliament. Which, surely, is a matter of opinion. Cripes, Trish, based on what you read on his blog? Ooh er. When reading anything that Cameron or his sock puppets squeeze through what I once called their ‘partisan cyberspace sphincter’, it’s useful to realise what a flexi-bendy-elasty approach he takes to ‘the truth’. Cameron Slater is running a pig-obvious and ugly personal vendetta against David Fisher, the NZ Herald and other journos at APN by name — using fair means and foul. He shows that facts don’t seem to matter to him. His pouting and disingenuously playing the victim in this episode (Fisher “fails to find any empathy or understanding about mental health issues” Waaah!) is Slater’s typical deceitful, hypocritical and misleading smear. In my (limited, but sufficient) observation, he will reach for any cudgel at hand to whack someone he has goaded. In my view Cameron’s sense of ‘offence’ about this minor Twitter hissy fit is exaggerated — and about as authentic as “beef lasagne” made from horse meat. Yes. Hey, nobody likes to be criticised, but Cameron Slater does seem remarkably thin-skinned and capricious for someone who engaged in his pastime … and who chooses to treat people the way he does. He really is a stalker.